The Agriculture Minister informed that the Soil Health Card portal has been linked to the Integrated Fertilizer Management System (iFMS) and distribution of fertilizers has started in 16 districts on the basis Soil Health Card recommendation as a pilot scheme. About iFMS: With the objective to monitor the import, production and movement of various subsidized fertilizers and processing subsidy claims, different software systems were introduced by Dept. Of Fertilisers viz FMS, mobile FMS (mFMS) and iFMS. FMS monitors the production, dispatches, receipts and sales of DAP, MOP, SSP, NPK and Urea (Indigenous and Imported) fertilizers from point of production to district warehouses. To achieve more visibility and transparency in the fertilizer supply chain from production to receipt at the last point sale (retail point), the mFMS was introduced in the year 2012. iFMS is more comprehensive, all-inclusive system which integrated, incorporates and enhances the features of both earlier systems i.e. FMS and mFMS. ICARDA’s focus: Drylands cover over 40% of the world’s land surface and span globally 100 developing countries with a growing population of more than 2.5 billion people. Although farmers in drylands are major crop producers and half of the world’s livestock is kept here, people are living in chronic poverty and facing challenges highly impacted by climate change. Scarce water resources, erratic precipitation, drought, salinization, land degradation, loss of traditional knowledge, unemployment, malnutrition and poor diets are new phenomena farmers in dry areas have to cope with. ICARDA combines scientific evidence and indigenous knowledge from dryland communities to address these challenges. Mandate: Within the CGIAR consortium, ICARDA has a global mandate for the crop development of barley, lentil and faba bean and serves the non-tropical dry areas for the improvement of water-use efficiency in agriculture, rangeland issues and small-ruminant production. ICARDA also contributes to the improvement of bread and durum wheat, kabuli chickpea, pasture and forage legumes, and associated farming systems. Genebank Resources and Services: Ranked among the top ten gene banks globally for barley, faba bean, durum wheat, chickpeas and lentils, ICARDA’s genebanks are a globally rich resource for agrobiodiversity, holding a total of 151,000 accessions from the ‘Fertile Crescent’ in Western Asia, the Abyssinian highlands in Ethiopia and Nile Valley, where earliest known crop domestication practices were first recorded. 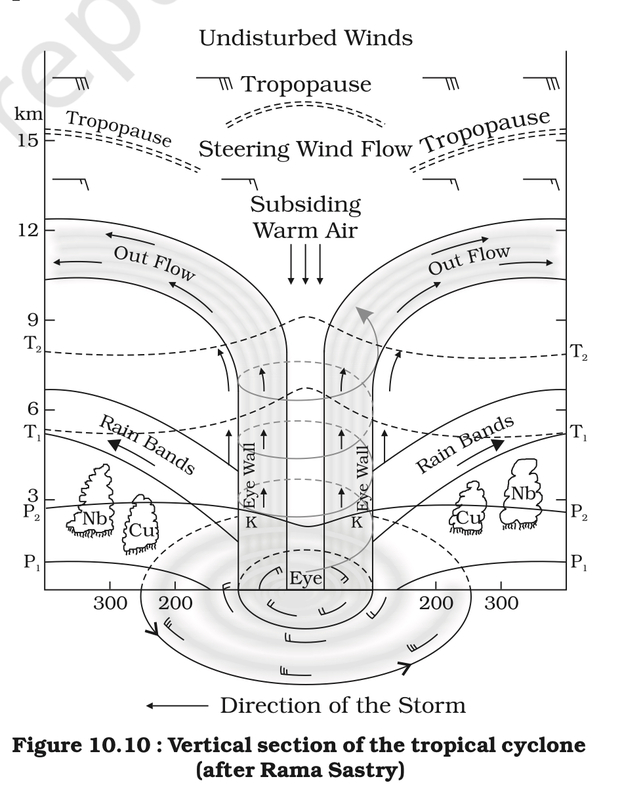 The conditions favourable for the formation and intensification of tropical storms are: (i) Large sea surface with temperature higher than 27° C; (ii) Presence of the Coriolis force; (iii) Small variations in the vertical wind speed; (iv) A pre-existing weak- low-pressure area or low-level-cyclonic circulation; (v) Upper divergence above the sea level system. The place where a tropical cyclone crosses the coast is called the landfall of the cyclone. The cyclones, which cross 20°N latitude generally, recurve and they are more destructive. Which one of the following statements about the Finance Commission is correct? The recommendations made by the Finance Commission are only of advisory nature and hence, not binding on the It is up to the Union government to implement its recommendations on granting money to the states. As rightly observed by Dr. P.V. Rajamannar, the Chairman of the Fourth Finance Commission, “Since the Finance Commission is a constitutional body expected to be quasi-judicial, its recommendations should not be turned down by the Government of India unless there are very compelling reasons”. Cyclonic storm ‘Ockhi’ recurved once it crossed the latitude around which the southernmost portion of which one of the following states lies? The cyclones, which cross 20°N latitude generally, recurve and they are more destructive. Accordingly, the cyclone should have recurved around the same latitude where the southernmost portion of Gujarat lies. Here, in the case of Ockhi, the recurving happened at around the 15°N latitude (perhaps, due to the movement of the ITCZ). Previous story Insights MINDMAPS: “PPP in Healthcare Delivery in India” and “Malaria cases in India”.